John Colson's was the eldest of his parents six children. His father, Francis Colson, was vicar-choral of Lichfield cathedral and his mother was Elizabeth. 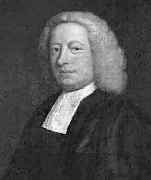 The family were closely related to the historian John Strype (1643-1737). John Colson attended Lichfield grammar school and we know from letters from Francis Colson written to John Strype in 1696 that his son John had visited London and called on John Strype but not found him at home. John Colson matriculated at Christ Church College, Oxford, on 26 May 1699 but does not appear to have graduated with a degree. In 1707 Colson published The universal resolution of cubic and biquadratic equations viz. Analytic, Geometrical and Mechanical in the Philosophical Transactions of the Royal Society. This was the most original piece of research that Colson produced in his whole career. In the paper he gave a method to solve a cubic equation which was similar to that which had been discovered by several other mathematicians. a3 = n + √(n2 + m3) and b3 = -n + √(n2 + m3). Now at this point Colson came up with a clever idea that nobody seems to have thought of before this time. He knew that a number had three cube roots, in particular 1 had the cube roots 1, (-1+√-3)/2, (-1-√-3)/2. He therefore knew that there were three possible values for a and three possible values for b. This, however, gave nine possible values for x = a - b. Colson tested each of these 9 possible solutions to see if it satisfies the original equation, and was able to identify the three actual solutions. This paper by Colson was the first to give all three solutions to a cubic equation. He then went on the give all four roots of a quartic, again being the first to do so. In the final part of the paper he gives a method to solve cubic and quartic equations using geometric constructions of circles and parabolas. But all these operations, whether in the common decimal arithmetic, or in this here compendiously described; and not only in decimal arithmetic, but in several other species, as duodecimal, sexagesimal, centesimal, etc. all these operations (I say) may be much more easily and readily performed, and with equal accuracy, by an instrument I have contrived called Abacus, or the Counting-Table, which I hope shortly to communicate to the inquisitive in these matters, and by which all long calculations may be very much facilitated. In the mean time this short account of negativo-affirmative arithmetic, in Denary or decimal numbers, may be premised, by way of introduction to the knowledge and use of the said instrument. Geographical maps and hydrographical charts, though they are representations of a convex spherical surface, yet were first delineated upon planes, as being the most easy and obvious, though not the most natural and accurate representations: And they will be sufficiently near the truth when the part of the Earth or Seas to be described is not of a very large extent. Such as these have been usually called chorographical and topographical maps; but when the map is any thing general, or is to contain any large tract of the Earth or Seas, suppose (for instance) one of the four quarters of the World as they are called; then, when they are projected, or represented upon a plane, the parts must necessarily be distorted, one way contracted beyond the truth, another way dilated, so as to give no just idea of the whole. [Colson] was a plain, honest man, of great industry and assiduity, but the university was much disappointed in its expectations of a professor that was to give credit to it by his lectures. He was opposed by old Mr De Moivre, who was brought down to Cambridge and created M.A. when he was almost as much fit for his coffin; he was a mere skeleton, nothing but skin and bones, and looked wretchedly ... . He was a very worthy, honest man; an old bachelor when he was first brought to Cambridge through the interest of Dr Smith, master of Trinity College, when he had chambers in Sidney College, and read lectures there in the mathematics. He was an humourist and peevish, and afterwards removed to an house in Jesus Lane, where a sister lived with him very uncomfortably, as their tempers did not suit. His most notable translation is probably that of Newton's work. In 1736, he published an English version of Newton's 'Method of Fluxions and Infinite Series' originally written in Latin. In the same year he also published the English edition of 'Geometrica Analytica' by Newton. Each of these translations contained substantial commentary by Colson. In 1761, an edition of Newton's 'Arithmetica universalis' was published in Latin with Colson's commentary, also in Latin. Colson showed himself to be ahead of his times by his translation of 'Analyitical Institutions' written originally in Italian by Donna Maria Agnesi, a professor of mathematics and philosophy at the University of Bolgna. It was the first book on calculus written by a woman, and Colson intended the translation to make calculus more accessible to women. His manuscript was not published until 1801, forty-one years after his death. He had also prepared a manuscript, with the same idea in mind, called 'The Plan of the Lady's System of Analytics', which still remains in the Cambridge Library. Few had much good to say of the appointment, and history has been content to see no great worth in it. That valuation may, in my opinion, deserve to be somewhat modified in virtue of his appreciation of the teaching needs of students. Colson had published Newton's (Latin) Fluxions in English, in 1736. Agnesi's volumes afforded him an excellent opportunity to display the value of fluxions and, particularly in Volume 2, he demonstrated many examples of what could be achieved, rendering Agnesi's differentials as Newtonian fluxions ... It seems probable that Colson's two works of translation, of Newton and Agnesi, well served English students at large, and, despite opinions to the contrary, also provided a fluxional tool adequate for research. This is indicated by the papers of the virtually unknown William Moore writing about rocket flight nearly five years before the start of the Cambridge Analytical Society.